Silest Little Salahuddin affectionately known as "Sal", born November 22 1940 in Sparta, Georgia and raised in Lakeland, Floridia. Sal born to the late George and Corine Little. He migrated to Newark, NJ in the late 60's. He worked and retired from Drew Chemical Co. he then took on the family business at Community Tire Shop. 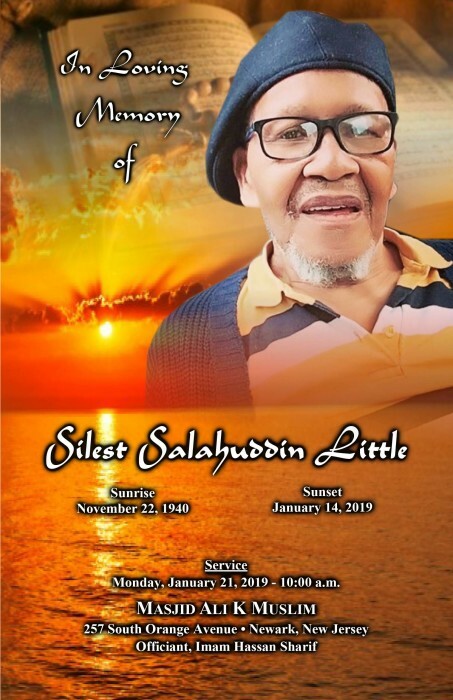 Sal was survived by Tarole Watts, Triene Lewis, Debora Gutridge, Qumara Johnson, Maisha Beyae and Qadriyyah Little.His siblings Clinton and Richard Little. His dear Aunt Gurdie Mae Little. The grandchildren Tere Patterson, Tyree Garnes, Idaysha Paige, Zayynah Muhammad, Tasia Lewis, Stephan, Michael,Kia Lewis and son in law Kenneth Lewis. The great grand childeren Jabril, Jamari, Jaylaa Patterson.